Ontario will bar employers from charging all temporary foreign workers recruitment fees, according to new legislation introduced Wednesday. 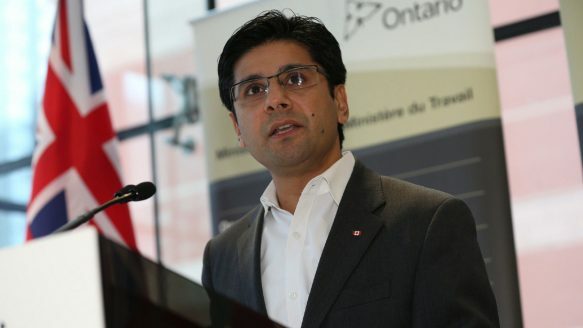 Ontario will bar employers from charging recruitment fees and seizing personal documents from all temporary foreign workers, says Labour Minister Yasir Naqvi. However, advocates for migrant workers say the proposed labour legislation falls short by failing to establish a registry of employers and recruiters similar to Manitoba’s, and holding them accountable by contributing to a bond that would compensate abused workers. The number of temporary foreign workers in Ontario has skyrocketed from 91,000 in 2008 to 120,000 in 2012, as in other provinces across Canada. “This is a good first step, but more needs to be done to reach out to migrant workers,” said Tzazna Miranda of Migrant Workers Alliance for Change. The extension of the protection to the growing rank of migrant workers is part of sweeping changes announced by Naqvi Wednesday morning to better protect vulnerable workers in Ontario, among them workers hired by temporary help agencies, unpaid co-op students and other unpaid learners. “Our government is standing up for workers and increasing fairness for business with this bill. It’s about taking action to protect the most vulnerable workers and level the playing field for employers, who play by the rules,” Naqvi told a news conference. The Stronger Workplaces for a Stronger Economy Act will eliminate the $10,000 cap on the recovery of owed wages and increase the period of recovery from six and 12 months to two years for employees. It will also make temporary help agencies and employers jointly liable for employment standard violations, which will help decrease the number of companies that hire individuals solely to work in unsafe conditions. Deena Ladd of Toronto’s Workers’ Action Centre said these changes can strengthen the protection of workers’ rights. She said the effectiveness of these new measures lies in the enforcement, and raising the province’s minimum wage from the current $10.25 to $14 will be the next step. In 2009, Ontario introduced a law to ban recruitment agencies from charging fees on live-in caregivers. Yet, critics said foreign caregivers are still being charged recruitment fees to secure jobs in the province. Flowers, food, fruits and wine are the markers of the holiday season – grown, packaged, shipped, cooked by migrant workers across this country. As people begin to plan festivities, the Migrant Workers Alliance for Change, is calling on migrant workers, undocumented people and their allies to join us at the Chinese Railway Workers` Memorial at 5pm in a vigil of somber reflection and to reiterate the need for immediate, urgent action to ensure justice, dignity and status for all migrants. 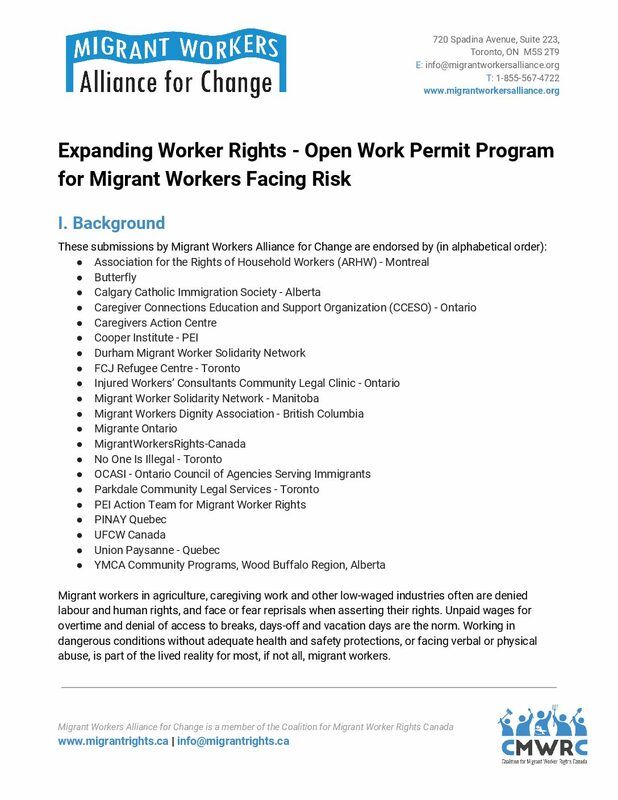 * A right to full protection for all migrants under all provincial laws, including the Employment Standards Act, Health and Safety laws and WSIB, and including no fees for any work placement. * Immediately implement a national regularization programs granting permanent immigration status for all non-residents living in Canada. On December 18, 2011, migrant and their allies around the world will come together on factory floors, in farm fields, in hotels and construction sites, and on the streets to commemorate and celebrate the struggles of migrant workers on the Global Day of Action Against Racism, And for the Rights of Migrants, Refugees and Displaced People (http://globalmigrantsaction.org/) – Join us in Toronto! More people are entering the Canadian labour force as temporary workers today then people entering Canada as permanent residents. Temporariness is also being instituted in the family sponsorship class, for parents and grandparents and within the refugee system. This means that migrants, often people of color, are being forced to work in sub-standard conditions, being used and abused by employers and corporations and sometimes having to make the difficult decision between living in the country without immigration status or being pushed out from communities and employment in the country. In spite of this, migrant workers continue to organize, to resist, and fight back. Join us on December 18, to continue this struggle. 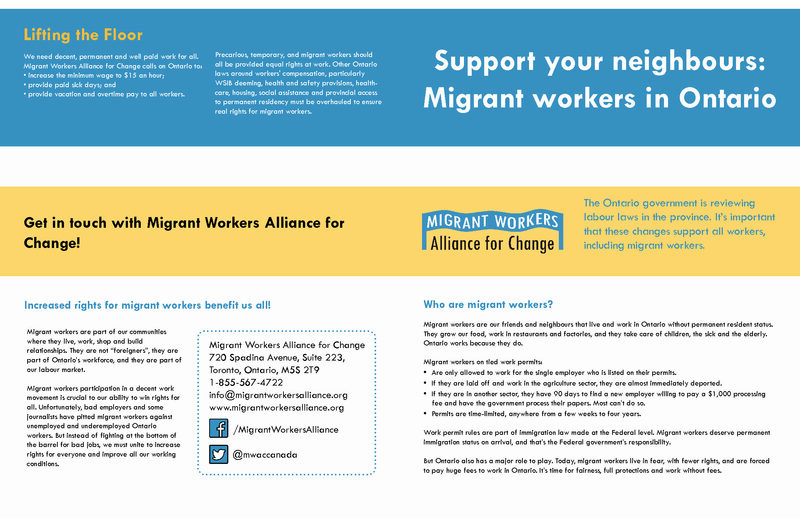 Note: Migrant Workers Alliance for Change will also be doing leafletting and flyering at 3pm at Yonge & Dundas Square. Foreign farm workers, nannies and other temporary labourers in Canada are forming a united front to fight for better treatment by employers. “What we are seeing now is a shift and expansion of the temporary foreign workers program from agriculture and live-in care to food industry, restaurants, hospitality and tourism,” said Sonia Singh of the Migrant Workers Alliance for Change, the coalition to be launched this week. Despite the recent economic downturn, the number of temporary foreign workers in Canada has skyrocketed from 160,908 in 2006 to 283,096 in 2010. Individual groups have organized within their own sectors, but it is time to have a united front to advocate for all foreign workers, who are at the mercy of Canadian employers and third-party recruiters, said Singh, whose group is made up of 17 grassroots organizations and unions. Resisting Precarity: An Immigration-Labour Policy Forum. Introducing the Migrant Workers-Alliance for Change. Join us at this forum to find out about the work and campaigns of the Migrant Workers’ Alliance for Change. Find out about new fact sheets and resources for community agencies working with migrant worker populations. Help strategize around winning protections for migrant workers and organizing against immigration policy based on temporary work and increased precarity in the context of a newly elected Harper majority.